To get the full experience of A Song of Ice and Fire Roleplaying, you must play a chronicle and engage in the Game of Thrones. With a setting as rich as Westeros though, where do you begin? The answer is the Chronicle Starter. This useful sourcebook details six sample houses, any of which can be run by the Player Characters. Choose your house and allegiance (Arryn, Baratheon, Frey, Lannister Stark, or Tully) or make up your own house and make allies or enemies of those provided. The Chronicle Starter also includes a complete scenario so you can kick off your adventures right away. Get ready to make your mark on the Seven Kingdoms! 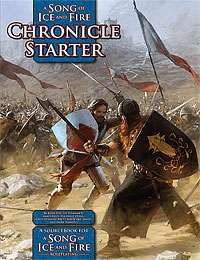 A Song of Ice and Fire Chronicle Starter is available at RPGNow.com.